Blackcurrant Cocktails are mainly cocktails with Crème de Cassis, which is a sweet, dark red liqueur made from blackcurrants. 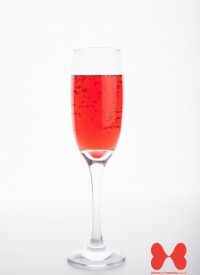 Blackcurrant flavour cocktails are famously associated with several Kir cocktail variations, such as the Kir Royal and the Kir Breton. Blackcurrant cocktails can often be quite tangy and the fruit gives many blackcurrant flavoured cocktails a beautiful purple hue. Other popular cocktails with Crème de Cassis include the Pink Russian cocktail and the Rosabel. Prosecco is an Italian white wine normally made from Glera grapes. The original wine used in the Kir was Bourgogne Aligote, a lesser white wine of Burgundy.